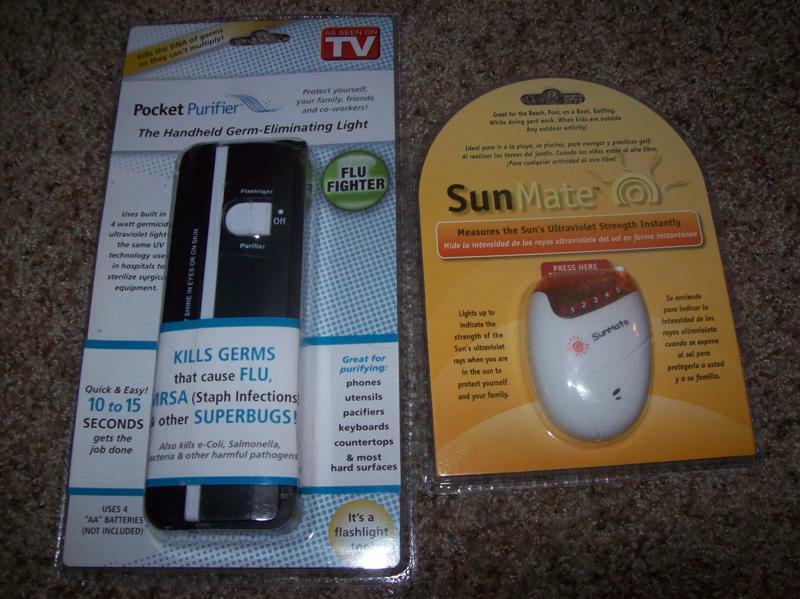 Purely Products sent me one of their SunMates and a Pocket Purifier for review. Besides my opinion, I want to include a bunch of info about the products themselves, what they are used for and how to use them so you know. First about the Pocket Purifier: Pocket Purifier sanitizes surfaces and objects with the same UV-C light that sterilizes surgical instruments. Ultraviolet light and nanotechnology eliminate 99.9% of germs that cause colds and flu, plus e-coli, salmonella, mold, fungus and MRSA (staph). My opinion: I used this product in the kitchen to sanitize the surface of my cutting board after cutting raw chicken and then switching to lettuce. I think that it is a very neat little object! Sometimes I feel like I cannot get stuff clean enough with a sponge so this tool helped a lot. Also I use in on the counters, fridge, microwave, and bathrooms. Very cool product! Next, the Sunmate gives "information on the intensity of ultraviolet rays right in the palm of your hand, so you can make preventive decisions on sun care protection." Also, the SunMate™ is not just for the beach or pool. Golfing, fishing, snow skiing, boating, softball - any sports; yard work, bicycling, walking, running, hiking, at the park with your kids or at baseball games - any outdoor activity, any day of the year. SunMate™ arms you with a read-out of the sun's UV ray intensity, so you aren't guessing what those cloudy skies might mean to your skin." Verdict: I think that this is perfect for the summer. All you have to do is press the button on the top to get your reading. I like this a lot too because it helps you to know how careful you need to be in the sun and how much SPF suntan lotion that you need to use. I will be using this for fun to monitor the rays. Thanks Purely Products for your neat little tools to help with everyday life!